This photograph is now half a century old. It was taken by the astronaut Bill Anders on Christmas Eve 1968 as the Apollo 8 spacecraft rounded the dark side of the moon for a fourth time. When earth came up over the horizon, Anders scrabbled for his Hasselblad camera and started clicking. This was not quite the first look at our world from space. Lunar probes had sent back crudely scanned images of a crescent earth shrouded in cloud. A satellite had even taken a colour photo that, in the autumn of 1968, the radical entrepreneur Stewart Brand put on the cover of his first Whole Earth Catalogue. The next edition, in spring 1969, used Anders’s photograph, by now known as Earthrise. Brand’s catalogue was a DIY manual for the Californian counterculture, a crowdsourced compendium of life hacks about backpacking, home weaving, tantra art and goat husbandry. Its one-world, eco ethos was a weird offshoot of the macho tech of the space age — those hunks of aluminium run on rocket fuel and Cold War rivalries. But then looking back at earth was itself a weird offshoot of the moon missions. It just happened that Apollo 8’s aim — to locate the best lunar landing sites — needed high-res photography, which was also good for taking pictures of planets a quarter of a million miles away. Brand was one of a group of environmental activists who felt that an image of “Spaceship Earth” would bring us all together in watchfulness and care for our planetary craft and its precious payload. Earthrise, though, did more than just corroborate this gathering mood. With its incontestable beauty, a beauty that had needed no eye of a beholder for billions of years, it caught the human heart by surprise. The earth pictured in Earthrise looks unlike traditional cartographic globes that mark out land and sea along lines of latitude and longitude. 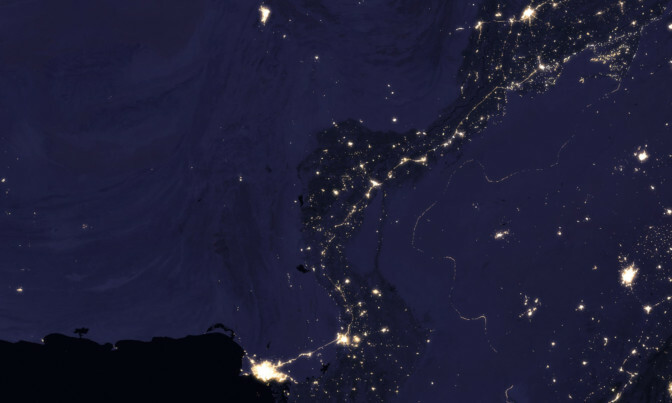 Slightly more than half the planet is illuminated. The line dividing night and day severs Africa. Earth looks as if it is floating alone in the eternal night of space, each part awaiting its share of the life-giving light of the sun. Apart from a small brown patch of equatorial Africa, the planet is blue and white. At first glance it seems to have the sheen of blue-veined marble. But look closer and that spherical perfection softens a little. Earth divulges its true state as oceanic and atmospheric, warmly welcoming and achingly vulnerable. The blue is light scattered by the sea and sky. The white is the gaseous veneer that coats our planet and lets us live. You can just make out the “beautiful blue halo”, with its gentle shift from tender blue to purple black, that Yuri Gagarin noticed on his first low-orbit flight. That halo is our fragile biosphere, and is all that stands between us and the suffocating void. To see the earth as it truly is, small and blue and beautiful... is to see ourselves as riders on the earth together, brothers on that bright loveliness in the eternal cold. Fifty years ago the biochemist James Lovelock was working for Nasa and developing a theory of earth as a single, self-regulating superorganism. It had reached a homeostatic state conducive to life, he believed, against odds as long as “surviving unscathed a drive blindfolded through rush-hour traffic”. Lovelock’s theory, later named Gaia after the Greek goddess of the earth, makes a special kind of sense when you gaze at our planet from the moon. MacLeish had jumped the gun by a few days; other writers had anticipated this sight centuries earlier. In his fantastical narrative The Man in the Moon (1638), the author and divine Francis Godwin has his hero fly to the moon in a machine harnessed to a flock of wild swans. As he ascends into space, the world’s landmasses diminish, not just in size but in significance — Africa is “like unto a pear that had a morsel bitten out upon one side of him” — while the ocean seems “like a great shining brightness” and the whole earth “masks itself with a kind of brightness like another moon”. Godwin grasped that from space earth would look terraqueous, and far more aqua than terra. In Jules Verne’s Around the Moon (1870), three adventurers, fired to the moon by a giant space gun, look back at earth and see “its delicate crescent suspended in the deep blackness of the sky” and “its light, rendered blueish by the thickness of its atmosphere”. When the narrator of H.G. Wells’ The First Men in the Moon (1901) sees earth from a spaceship, its three-dimensionality starkly reveals itself in the dance of sunlight and shadow on its surface. “The land below us was twilight and vague,” he writes, “but westward the vast grey stretches of the Atlantic shone like molten silver.” These early sci-fi writers guessed correctly that, from space, a world made of water and air would shimmer as if it were alive. They saw Earthrise before the astronauts did. Fanciful space flights, full of backward glances at our world, occur in very ancient texts. The lesson is always the same: don’t imagine you matter. The vastness of the world, which renders your own life so little, is itself a speck of dust adrift in the vast cathedral of space. Cicero’s Republic imagines the dead Roman general Scipio Africanus, hero of the second Punic war, appearing to his grandson, Scipio Aemilianus, in a dream. The younger Scipio finds himself in the heavens gazing down on Carthage, which he will later destroy in the third Punic war. The world has shrunk to the point where he is “scornful of our empire, which covers only a single point upon its surface”. The ancients knew how minuscule our preoccupations would seem from afar. The whole earthers of the 1960s thought that photographic proof might help us to see this obvious truth in new ways. Border disputes, imperial wars, the enslavement of other peoples, the spoiling of the planet for selfish and ephemeral gain: all would be exposed as what the cosmologist Carl Sagan called “the squabbles of mites on a plum”. And yet, to a mite, that plum is everything. The power of Earthrise as an image derived partly from its being a picture of the plum taken by a mite — one of the first three to escape the plum’s gravity. With the brown-grey desert of the moon as contrast, the earth shone as if alert to its singularity. As Marina Benjamin writes in her book Rocket Dreams (2003), this made it “difficult not to imbue the planet with exemplariness”. Earthrise was edited for anthropocentric ends. 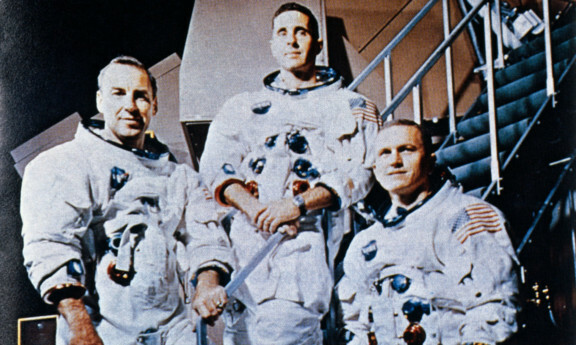 The Apollo 8 crew saw earth to the side of the moon, not above it, and to them it seemed tiny. Anders compared it to being “in a darkened room with only one visible object, a small blue-green sphere about the size of a Christmas-tree ornament”. Nasa flipped the photo so that earth seemed to be rising above the moon’s horizon, and then cropped it to make earth look bigger and more focal. 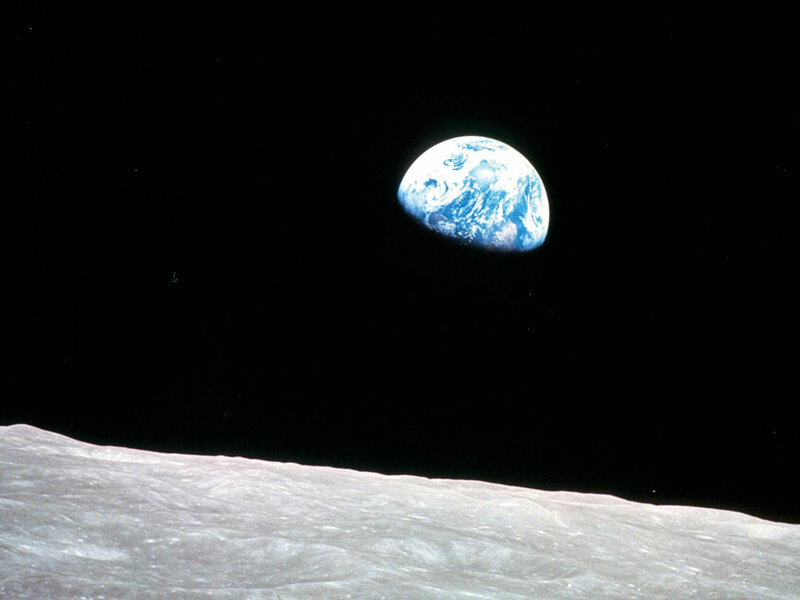 Earthrise was an earth selfie, taken by earthlings. Since 1968 the earthlings have had many visual reminders of their cosmic irrelevance. Their home planet has been demoted to what Sagan called the “pale blue dot”, the tiny fleck of earth, no bigger than a pixel, in a photo of our galaxy taken in 1990 by the Voyager 1 probe from 3.7 billion light years away. But we prefer to ignore the evidence. In our daily lives we are all flat earthers. We carry on thinking that the sun rises in the east and sets in the west. Nor is our stewardship of the planet any less culpably forgetful. We still squabble over the juiciest bits of the plum; we still fight and die over its pinprick empires; the rich and powerful seem more ludicrously puffed-up than ever. Did the 22-year-old Donald Trump, when he first saw Earthrise, feel awed and humbled by human smallness? I’m guessing no. Our species is just as venal and measly-minded as it was half a century ago. Perhaps more so, now that the technology that excites us is not the rocket blasting us into deep space, but the computer coding that blasts us through a wormhole into cyberspace: a human-built universe composed of our own self-admiring obsessions, exhilarating and exhausting enough to fill a lifetime. Still, Earthrise must have changed something. What’s seen can’t be unseen. Perhaps it flits across your mind when you open Google Earth and see that familiar virtual globe gently spinning. Just before you click and drag to fly yourself to some portion of the world no bigger than an allotment, you may briefly take in, with a little stomach lurch, that this slowly revolving sphere holds close to 8 billion people, living out lives as small and short and yet meaningful as the universe is infinite and eternal and yet meaningless. On that gigantic, glistening marble, mottled with blue-white swirls, lies everyone.